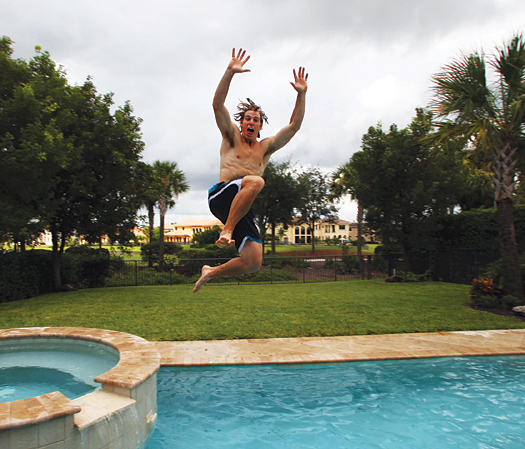 It’s the day after the end of the 2010-11 NHL regular season, and David Booth is holding court with reporters discussing anything and everything about the Florida Panthers and his budding NHL career. When the topic turns to playoff predictions, Booth delivers a pick that would eventually make him look like a savant. Booth then tries his hand at predicting the unpredictable Western Conference. This time he doesn’t fare so well. Being born and raised in Michigan, Booth has never hidden his affection and loyalty for Hockeytown, USA. The excitement in his voice is palpable every time the Panthers are set to play the Red Wings, and it’s no great secret he would have loved to wear the red and white. Instead, Booth has spent his NHL career some 1,300 miles to the south. Fort Lauderdale is a long way – literally and figuratively – from the Motor City. But for Booth, one of the many stars who jumpstarted his NHL career with the National Team Development Program, South Florida has pretty much become home. “I guess growing up you always dream of playing for your hometown team, but you know what, God has a plan and his plan was to put me in Florida, and I couldn’t be happier where I’m at,” Booth says. Booth, who turns 27 years old on Nov. 24, first joined the Panthers in the 2006-07 season, and it didn’t take him long to establish himself as one of the team’s best players. There’s been a tremendous amount of turnover on the Florida roster since Dale Tallon took over as general manager in May of 2010, but Booth is one of the guys that the Panthers consider a cornerstone in their rebuilding project. “The reason he stuck around was because he fits exactly the type of player we’re looking for,” says Florida assistant GM Mike Santos. It isn’t just his on-ice contributions that make Booth such a highly regarded member of the organization. With his outgoing personality and easy demeanor, he quickly became a fan favorite. The Panthers made him the face of the franchise after he broke out with a 31-goal season in 2008-09, putting his image on the homepage of the team website the following season. It wasn’t something the reserved and humble Booth necessarily cherished, but he does enjoy the chants of “Boooooth, Boooooth” that have rung through the BankAtlantic Center the last few years whenever he’s skated up ice with the puck. 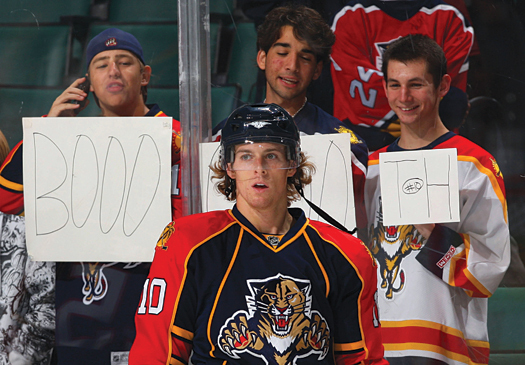 No question, Booth has been doing his part to grow the sport in the Sunshine State. He is among the most requested players on the Panthers when it comes to appearances, and he’s always willing to give his time. Last season, for example, he addressed a group of fans in the stands after a home game as part of a Family of Faith event. This summer, he took time away from his offseason vacation to fly back down to South Florida and run a camp for Hockey Ministries International. And when the Panthers decided to have a “Root Beer Summit” for two Mite players whose scuffle became a hit on YouTube, it was Booth who was called upon to play the role of mediator. Booth clearly believes in giving back, and he’s been doing just that since his rise to prominence with the Panthers. “One of my favorite Scripture verses is, ‘To whom much is given, much is required.’ I think that I’ve been given so much,” Booth says. Along with the camp, another summer ritual for Booth is taking a trip to indulge one of his passions – hunting. After going to New Zealand last summer, this offseason he ventured to Alaska to hunt grizzlies with his bow and arrow. “I got to share the experience with my dad, so that was something I’ll never forget,” he says. With his outgoing personality and easy smile, David Booth has become a fan favorite in Florida Panthers fans, who yell “Boooooth” every time he touches the puck. Something else Booth enjoys is representing his country in international competition. 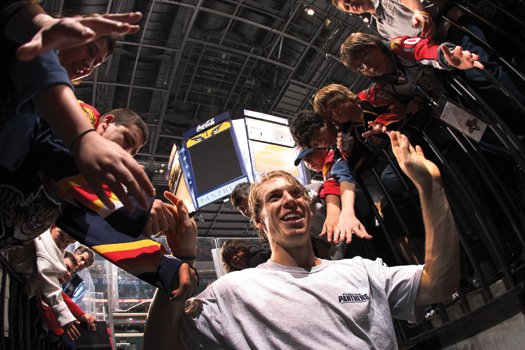 During his one year with the NTDP, Booth was selected to play in the 2002 IIHF World Under-18 Championship, helping the United States to capture the gold medal. Two years later, he played a key role in leading the U.S. to its first gold medal at the World Junior Championships. The only thing missing from his international resume is suiting up for an Olympic tournament. After receiving an invitation to the U.S. Olympic Orientation Camp in the summer of 2009, Booth appeared to be on the fast track to Vancouver before a concussion derailed his chances of making the U.S. squad.The injury he suffered in October 2009 forced Booth to miss the next 45 games before returning in late January, only a couple of weeks before the Olympic flame was lit. “It was disappointing, but there’s a reason for that,” Booth says. “I’ve grown a lot because of that concussion, and I’m glad I went through it in hindsight." As if missing the Olympics wasn’t bad enough, Booth sustained another concussion in late March, ending his season and raising questions as to whether he’d ever be able to return to the level of play he had reached. Booth answered that question last season as he played all 82 games while scoring a team-high 23 goals. In recognition of his comeback, the South Florida Chapter of the Professional Hockey Writers Association nominated him for the Bill Masterton Memorial Trophy. To get ready for the new season, Booth stepped up his offseason workout regimen, training even harder, he says, than ever before. He is excited about the prospects for the new season after the Panthers acquired a dozen newcomers in the offseason, including former All-Star defensemen Brian Campbell and Ed Jovanovski, as well as promising forwards like Tomas Fleischmann and Kris Versteeg. Even with all the newcomers, Booth remains a big piece of the puzzle in Florida, and he’s confident he can reach the 30-goal plateau again. But the biggest goal for him is ending the Panthers’ 10-year playoff drought. “I know that we’re going in the right direction,” Booth says. “What Dale [Tallon] did in Chicago, I believe that’s going to happen here. We’re going to win a Stanley Cup. I’m glad to be a part of the team. I want to be a part of the solution here, to make the playoffs and eventually win the Stanley Cup. Alain Poupart is a freelance writer based in Miami Lakes, Fla.